Yotsuba & the American Southwest! Japanese icon and adorable green-haired girl toured the US! And here are the pictures to prove it! For the record, Yotsuba&! is the one manga I recommend to people who aren't fans of manga and anime. I say this because, although I love comics of all kinds, I don't have any particular predilection towards the stuff myself. Yotsuba by Kiyohiko Azuma, on the other hand, deserves special recognition in that, in the so-far-published 12 volumes, it is really just the story of how a little pre-school age girl views the world for the first time. Having spent her formative years on a small island with only her dad for company, she now views everything with wonder and excitement - and I haven't met anyone that hasn't laughed out loud while reading it. The title, by the way, refers to Yotsuba & (whatever she's looking at this week)! So, with that in mind, here is Yostuba travelling the Southwest. I gave my wife the Yotuba plastic model kit a while back, and she suggested we take pictures of it on one of our recent detours through the US (we never take the short way) - I may have gone overboard with the pictures. 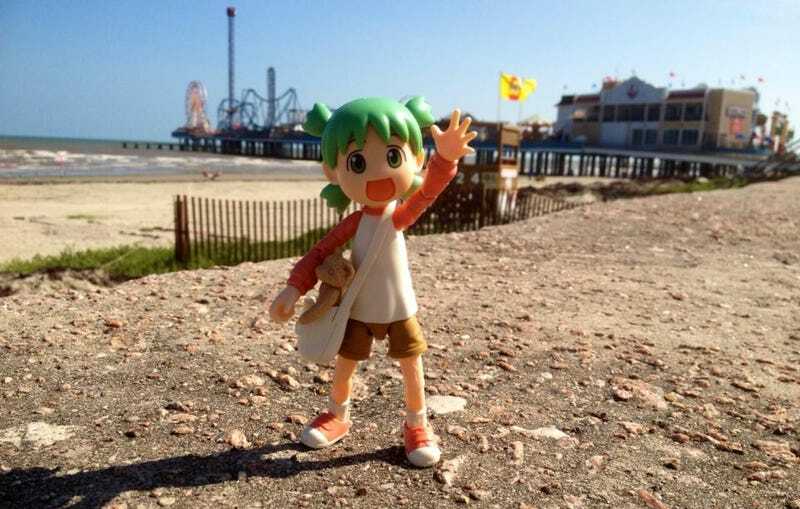 Above is Yotsuba & Pleasure Pier in Galveston, Texas! Yotsuba & Sam Houston! The largest statue of a Texas historical figure, near Huntsville. Yotsuba & the Garden of the Gods near Colorado Springs! Yotsuba & Arches National Park! Yotsuba (and Danbo) & Balanced Rock at Arches National Park! Yotsuba & Turret Arch at Arches National Park! Yotsuba (and Duralumin) & the Pinkerton Hot Spring, near Durango, Colorado! Yotsuba (and Danbo) & Knife's Edge Trail, Mesa Verde National Park, Colorado! Yotsuba (and Danbo) & the Prada Store at Marfa, Texas! Yotsuba & the closed Prada Store near Marfa, Texas.